After the tedious exams Chemical Engineering students has to go through to pass the Board exams, finally the most awaited moment has come! PRC has released the list of the students who passed the November 2016 Chemical Engineer Licensure Exams. 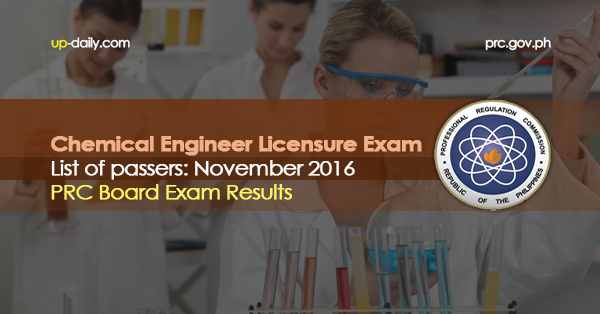 According to Professional Regulation Commission (PRC) out of the 918 takers 534 passed the November 2016 Chemical Engineer Board, approximately 58.1% passed the said Board exam. The said examination covered the following cities: Manila, and Cebu of November 2016. * 2 sets of documentary stamps. Roll of Successful Examinees in the CHEMICAL ENGINEER LICENSURE EXAMINATION held on NOVEMBER 18, 2016 & FF. DAYS released on NOVEMBER 22, 2016. Stay tuned for further announcement regarding the schedule of Oath Taking or you can inquire once you’re in the PRC premise.